Welcome to my cartoon shop | Amsterdam, baby! Like my cartoons? Many of my cartoons can be bought at socity6 through my profile page. 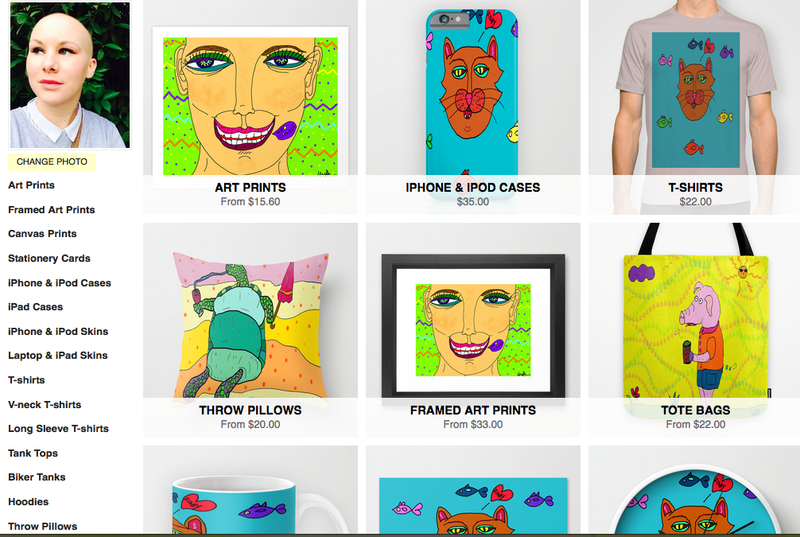 Here you can find the perfect gift for her, like a tote-bag with a unique motif, or an amazing birthday or Christmas present for him, like a t-shirt with a cool art print. Buy cheap and fun cartoons that will bright up your life. Available as art prints, framed art prints, wall-cloks, pillows, shower curtains and more. Also you can find shower curtains that will add some color and humor to your bathroom, wall-clocks for the kitchen or office space, throw pillows with animal illustrations,bright patterns and other prints for the couch in the living room, or for the children’s room. If you want to protect your iPhone 6 or computer you can buy phone cases, or cases for laptops. As you can see, my cartoons comes in various forms and shapes, so click here and take a look, get cheered up by the great offers and get inspired from the artiness. PS: Is there a specific cartoon you want made for a special occasion like wedding, birthday or Christmas? Write to me using the contact form and we can fix this.